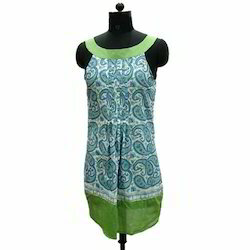 Leading Manufacturer of sea green printed tunic, halter neck short kurta, boat neck sleeveless kurta, round neck balloon top, spaghetti neck short dress and v neck sleeveless kurta from Jaipur. Backed by the vast experience and knowledge in this field, we are actively involved in offering a premium quality collection of Sea Green Printed Tunic to our respected clients. This productis available with us in various sizes and colors as per the precise requirements of our clients. Best quality fabric and advanced technology used in manufacturing these products to suit the variegated preferences and needs of our clients. 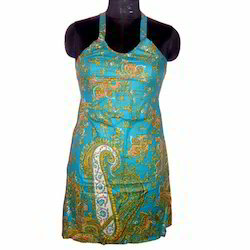 To maintain and follow the set industry quality standards, we are engrossed in offering a quality approved range of Halter Neck Short Kurta to our broad client base. The kurta we are offering widely demanded among the clients for its neat stitching. Offered collections of products are available in committed frame of time from us. Moreover, these items are able to offer maximum comfort to the wearer. We are offering these clothing at pocket friendly prices. With the support of our well-organized employees, we are engaged in fabricating Boat Neck Sleeveless Kurta at very reasonable prices. Our range can be availed in various designs, which is highly comfortable yet stylish. Apart from this, we make our range from superior quality raw material. Our range of Kurta can be worn on different occasions and can be availed in a variety of sizes and colors. An ideal summer be dressed in, this is a comfortable top. These sleeveless balloon tops are accentuated with attractive neckline. This gives a cool look. 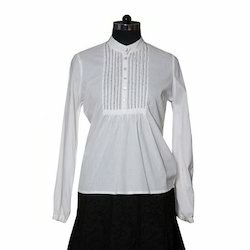 This simple top will add plenty of styles to any day time attire. Spaghetti Neck Short Dress offered comes in bright innovative designs as well as feature use of bright color shades which makes these provide for exclusive looks. Further, these dresses can be made available in options of different sizes and also provide for comfortable wear option. Some of its features include can be offered in different color choices to pick from; offered enhanced visual presentation; exclusive designed choices; use of bright colors for enhanced visual appeal; innovative and bright designs. We are a trustworthy organisation in offering a wide gamut of V Neck Sleeveless Kurta. We are a trustworthy organisation in offering a wide gamut of V Neck Sleeveless Long Kurta. Owing to the being there of our specialist craftsmen, we have been able to fabricate and provide a striking compilation of Full Sleeves Short Kurti. This range is exclusively intended, keeping in mind the preferred selections of precious clients. Our range is obtainable in various nice-looking color combinations and ideal to improve the charm and glamour of the wearer. We provide this range to our clients at market leading prices. White colour always give a cool and elegant look. It represents simplicity. 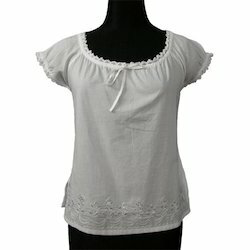 This simple white round neck top embroidered in the bottom makes it a trendy as well as very sober. This top can be worn anytime when anyone wants to feel comfortable and trendy at the same time.